Crotalus adamanteus is the largest of all rattlesnakes currently recognized. Crotalus adamanteus are large, heavy-bodied snakes with large, broad heads with two light lines on the face. Males are larger than females. The background color of Crotalus adamanteus is brown, tan, or yellowish and covered with the namesake diamonds, which are brown and surrounded by lighter scales. The tail is usually a different shade, brownish or gray, and toward the end of the tail the diamonds fade out or break into bands. An adult pair of Crotalus adamanteus require a terrarium of at least 2.5 x 1 x 0.5 meters (width x deep x high) (8.2 x 3.2 x 1.6 feet). You will need the space to work safe with this kind of snakes and at certain times these snakes are very active. In the fall they sometimes make a journey of several kilometers back to their winter dens in the wild. Some even have been found swimming at sea between the Florida keys. It is best to use wooden cages and at least 0.006 meters (0.02 feet) thick glass for front windows for these powerful large snakes. Hide boxes could be handy with maintenance work in the terrarium, but most of the time Crotalus adamanteus are not to shy (cb and ltc animals) and will not be in the box. It’s a good idea to use some decent size logs and stumps in the terrarium to create visual barriers. This is a great help during feeding and spot cleaning. A mix of cocos chips and peat has worked great over the years for Crotalus adamanteus. A layer of 0.05 to 0.1 meters (0.16 to 0.32 feet) is recommended. Because of the big enclosure and the fact they like to bask a solar raptor 100 watt UV bulb is used. During the warm months in the summer a 40 watt spotlight is used instead. Under the basking light is around 40 °C (104 °F) , warm side is 29-32 °C (84-90 °F) and 24-26 °C (75-79 °F) on cool side. At night all heating is switched off with temps dropping around 19-24 °C (66-75 °F) depending on season and outside weather. It’s recommended to use a decent sized water container (500ml +) since Crotalus adamanteus can drink a decent amount of water. Water dishes are cleaned 2 times a week. While this species reportedly goes into the water in the wild, I have never witnessed them soaking in captivity. No special attention is needed on the humidity. From May to September the enclosure gets sprayed 2-3 times a week with water in a way that it is drying up in 2 hours. Also before a shed its best to give to Crotalus adamanteus some extra humidity. Wild caught Crotalus adamanteus are notorious and difficult feeders. CB snakes are good feeders most of the times. Adult snakes feed on 350-500 gram thawed rats every 4 to 6 weeks. Juveniles start to feed at around 2-3 weeks of age on half grown to adult mice. I had more success in feeding live prey the first couple of times. I feed my juveniles every 7 to 10 days. As mentioned earlier, Crotalus adamanteus get a good size and have some temperament. A adult 5kg+ individual can give you a decent challenge. They have a long strike range, long fangs and a real big dose of potent venom. 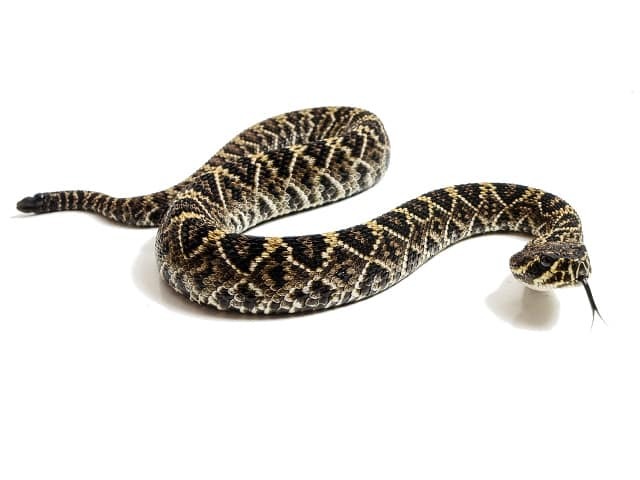 With bigger Crotalus adamanteus keep handling to a minimum , since they are heavy bodied and you might damage the ribs with thin hooks. Best type of hook is a “gabby hook” style. Make sure to use good size boxes or barrels and have decent room for moving around. I spot clean when feces are present. A full change of the substrate and disinfecting of the enclosure is taking place every 2 to 3 months. It’s best to spray more during shedding period, but even if kept completely dry there are very seldom problems with shedding in healthy snakes. Being a rattlesnake species, after every shed a shackle is added to the rattle. Bites to each other (when feeding in the same cage) can prove lethal due to the big fangs. Also as mentioned above damaging/breaking ribs with thin hooks can be a problem. Make sure to hibernate in dry conditions and not below 10 °C (50 °F) in order to avoid respiratory problems. Otherwise this is a very hardy species which easily lives over 20 years of age.